Stanley claimed that "Every Carpenter needs two or more wood planes in his kit, for rough outside work" and that "wood planes push easier." Thus, these planes were offered as an alternative to the metallic planes. Furthermore, some guys preferred the feel of wood against wood, like that afforded by the old style wooden bench planes. But, they also understood the benefit of the patented adjustment features found on the metallic planes. Stanley made it possible for these guys to have their cake and eat it, too, by offering these planes. There are many different sizes of these wood bottom planes, often called transitionals (they bridged the all wood and all metal designs), than there are of the metal ones. Why? Because patterns are not needed for wooden bodies like they are for metal bodies. Thus, the plane's body could practically be any size desired. The 18 different models attest to this fact - all of them are different lengths and widths. Guys could also tailor their wooden plane to the exact length with which they were comfortable by sawing off the toe and/or heel. Judging by the numbers still out there, these were very popular planes, so popular that many of Stanley's competitors decided to make their versions of wood bottom planes (makers such as Sargent, Union, Birmingham, Siegley, etc.). When sold originally, they were at a price somewhat less than their iron counterparts making it possible for the average Joe Meatball of the day to afford a plane that came equipped with the Bailey patented features. There are only a few numbers that are generally considered anywhere near collectible - the #21, #25, and #37. Of course, the earliest versions of the planes, mainly the ones made by Leonard Bailey himself in Boston, are scarce and collectible. There are some late production wood bottom planes that have the Hand-y grip feature, similar to that found on the common metal block planes, milled into their wooden bodies. These planes are very rare. The last models to leave New Britain have unusually tall knobs - it seems that the high knob craze sweeping the metallic line of planes found its way onto these tried and true planes; the high knob versions are rather scarce, and the knob is fastened with a long wood screw, not the brass nut on a threaded rod used on the metallic planes. The basic design of these planes consists of a cast iron frame that is screwed onto a wooden body. The frog rests over a bridge in the frame, the knob sits atop the front of the frame, and the tote is screwed into a raised boss cast into the rear of the frame. The wood - knob, tote, and body - are made of beech, and often covered with a very heavy varnish that practically obliterates the wood's grain. The plane's number is stamped (incised) into the toe, usually along with the company's name and, on the earlier examples, an eagle. The knob is secured directly to the wooden body by means of a regular wood screw, so don't go thinking you can use the fastening means (a threaded rod and a slotted nut) as that found on the metallic planes as a replacement. In fact, there is little that can be salvaged from these planes to use as parts on the metallic planes and vice versa. The tote does use the same fastening means as that found on the metallic planes. However, the tote is not secured as well on the wooden planes. The larger metallic planes have a small machine screw at the front part of the tote, while the smaller metallic planes have a raised nib cast in the main casting. Both of these features help to overcome any lateral twisting of the tote. The wooden planes do not have either of these supplemental measures for securing the tote. Perhaps Stanley felt they were unnecessary since the wooden planes are lighter than the metallic ones and the strain on their (wooden) totes wasn't as great as that on the metallic planes' totes. Whatever the reason, I've seen many totes on the wooden planes that are very loose. The totes on these planes are normally found cracked and broken. The frog is adjustable, but in order to take advantage of this feature some modification to the bed must be made. Due to the design of the frog (it sort of looks like the ones used on the iron planes, but is shorter along its bed length), in conjuction with the use of wood as the body, the cutter can be unsupported for a good length when the frog is moved forward. The wood can't be adjusted, but the frog can, which means that the cutter will flex backward as the plane is pushed forward, likely chattering, when the frog's face is not co-planar with the bed. Even Stanley mentioned this shortcoming in their tool propaganda. To overcome this problem, Stanley recommended that a shim of cardboard or veneer be glued to the bed to make it co-planar with the face of the frog. This remedy was particularly useful when the sole became worn, which inevitably increased the width of the mouth necessitating that the frog be moved forward to compensate for the increase in the mouth's width. On the earlier models of this class of planes, those made prior to ca. 1915, the screws used to hold the frog to the plane are wood screws and have round heads. These screws, over time, tended to strip the wood, making it impossible for the frog to be secured to the plane. You'll occasionally see examples where the screw holes have been plugged and then re-tapped. Stanley addressed this problem with their 1912 patent which called for brass bushings to be screwed and pinned into the wood, and to use flat-head machine screws to secure the frog to the bushings. I often find the brass depth adjustment nut on these planes to be difficult to operate, especially on the smaller models. Reason being that the cast iron frame makes it difficult to get a good grip on the nut; you can only turn the nut at its top, unlike from all around it like you can on the metallic models. All these planes are equipped with a unique style of lever cap. It operates just like the lever cap used on any common metallic bench plane, but its finish and casting is different. The lever cap has a stippled surface cast into it and is japanned on its top. The rivet to hold the lever cap spring is not machined flat on the surface. Instead, it's left proud and is rounded. At the lowermost edge of the lever cap, where it makes contact with the cap iron when it is locked in place, there is a machined decorative motif, similar to two opposing reverse ogees. This motif is not japanned but is machined smooth. The earliest models of these planes have lever caps that are smooth, but are also japanned all over. I've seen some of the early lever caps that have the corners knocked off, down where they bear upon the iron. Since the corners have japanning on them, it appears that this was intentional and was probably some feeble attempt to make the lever cap slide into the body easier without what normallay are square corners digging into the wooden body. There really isn't too much that can go wrong with these planes other than the fact that they usually look like what you'd expect a plane to look like after leaving it on your local Interstate or railroad tracks and letting it suffer the ravages of heavy traffic flow. They are rugged guys that served their owners well. Other than the obvious casting breaks about the frog or the frame itself, the most common problem with these planes is their soles. Through repeated use, they become sole shot. You'll often find examples that list to one side, have been re-soled over their entire length, have a length of metal screwed into the sole, or have a piece let into their soles to close their mouths. You can sometimes find the planes so riddled with worm holes that they resemble Bonnie and Clyde's last stand. Stay away from these instant Uncle Miltie's ant farms, or you're asking for trouble - hungry worms like to do roadtrips in their quest for other succulent woods, and might decide to set up shop in your Chelor's or Nicholson's. These planes are very cheap (in price), and are worth obtaining to practice your restoration skills. A few caveats - the frogs of the wood bottom planes are not interchangable with the metallic planes, and vice versa. Also, the cap irons are not interchangeable. The slot in which the depth adjusting fork engages is located higher up, toward the top, of the cap iron. If your plane's iron can't be adjusted for a fine cut, you have a cap iron from a metallic plane. The later cap iron of this series of planes does not have the 'hump' formed in it, down where it covers the iron near its cutting edge; it just bends abruptly to make contact with the iron. You can also sometimes find these cap irons with two slots milled in them, one slot above the other. 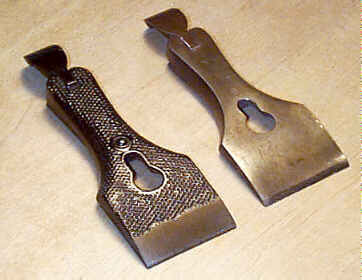 These cap irons were likely left-over stock, when the transitional line went extinct, and Stanley milled the lower slot so that they could be used on the metallic planes. You might stumble across a transitional that has a bottom made of a wood other than beech. These planes were retrofitted by later day owners who decided to make another bottom. I've seen a laminated maple and mahogany one that looked rather cool. Since scribbling this description (1997), three very rare 'custom' transitionals have surfaced where the body is a composite of rosewood and boxwood; the rosewood, which acts as the sole, is dovetailed into a chunk of boxwood. These planes are definitely Stanley-made as the early company logo (the crude eagle logo) is stamped into the endgrain of both the rosewood and boxwood. The totes and knobs of these planes are also fashioned from rosewood. These planes may have been a custom order or were purposely made for display at an exhibition of some sort. Regardless of why they are made, they are striking looking. Examples of these planes in succulently mint condition are very difficult to find, even more so in their original boxes. The longer planes were shipped wrapped in brown paper with a label afixed on the paper. Planes in mint condition can command a real premium, so if you find one that's never been used, sell it and take the proceeds to buy 100 ones that have been rode hard and put away wet. A certain plane sect, located in the northeast, practices a bizarre and ritualistic ceremony where transitional planes are set aflame a la a funeral pyre. Whether it's in homage to Leonard Bailey, to appease the spirit of Justus Traut, or is symbolic of the sect's mission in life to turn old tools into cash, no one knows for certain. Regardless, it's a sight to behold, and not to be missed, given the opportunity to witness a Trans-Ferno immolation in person. And, no, it's not done under the anonymity of a white hood. Contrary to most things in life, smaller is better when collecting bench planes, and this model is no exception. It's not rare, by any stretch of the imagination, just popular with collectors for the same reason the #2 is popular with them - they are both 7" long. This plane, and those that follow up to and including the #25, never had a tote. These planes are simply too short for a tote to fit on them. To provide for a comfortable grip, the rear of the cast iron frame is rounded allowing it to fit into the palm of the hand easily. #22 Smooth plane 8"L, 1 3/4"W, 2 1/2lbs, 1870-1943. This model has been observed with the Hand-y grip feature milled into the sides of the bottom, toward the rear. A crafty woodworker could easily duplicate this, so be very careful if you're about to cough up the megabucks it takes to own one. #23 Smooth plane 9"L, 1 3/4"W, 2 1/2lbs, 1870-1918. #24 Smooth plane 8"L (9"L 1922 on), 2"W, 2 7/8lbs, 1870-1943. The increase of this plane's length to 9" in 1922 probably reflects the demise of the #23, which probably should have come equipped with a 2" wide iron in the first place. It took Stanley nearly 50 years to realize this. This is a funky little guy. 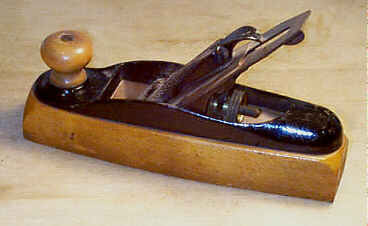 It is a block plane technically, since its cutter is bevel side up. Its cutter is bedded at 35 degrees, which is very steep for a plane of its function. So why is it so steep? To allow the plane to use the Bailey cutter depth adjustment feature on a wood bottom plane - there simply isn't enough room for these features if the cutter were put at a lower pitch. This plane has the same plate that screws onto the cutter as that used on the #9 (see this one for an image of the plate), #11, #11 1/2, and #164. This plate is similar to the regular cap iron (for bevel side down planes) where the slot in it permits the adjusting fork to engage and then allows adjustment. Make sure this plane has the plate, and not a replacement cutter and cap iron taken from a similar width bench plane. Many times you'll find these planes with a replacement cutter and a conventional cap iron where the bevel is oriented downward. #26 Jack plane 15"L, 2"W, 3 3/4lbs, 1870-1942. The workhorse of the entire series, I see more of these, and the #27, than any others. #27 Jack plane 15"L, 2 1/8"W, 4lbs, 1870-1918. This plane and the #27 1/2 both have irons that are non-standard widths and do not have equivilent width irons in the metallic planes. This plane's iron, at 2 1/8" wide, might be considered by some to be an odd dimension, but when this plane made its debut bench plane irons were commonly sized by the 1/8". #27 1/2 Jack plane 15"L, 2 1/4"W, 4 3/4lbs, 1898-1934. Hey, if Stanley can make a fractional metallic bench plane, they surely could do the same with the wood bottom. And, they did, but they never delved into the 1/4's like they did with the bench and block planes. Yow, did they pull some stupid stuff! Maybe they foresaw the rabid collectors coming down the pike? The iron on this plane is often pilfered for the more valuable early models of the #5 1/2 and #605 1/2 (and their corrugated versions) as replacements. 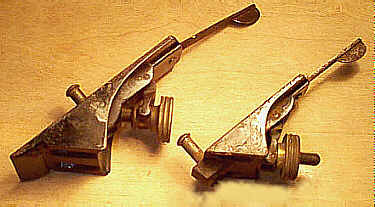 Stanley made a blunder when they designed these early versions of the metallic planes, and it's common to find these two planes with irons that have the later notched rectangle logo. While certainly not rare, this plane is the most difficult to find of the common transitionals. #28 Fore plane 18"L, 2 3/8"W, 5 1/2lbs, 1870-1943. #29 Fore plane 20"L, 2 3/8"W, 6 1/4lbs, 1870-1918. #30 Jointer plane 22"L, 2 3/8"W, 6 1/4lbs, 1870-1918. #31 Jointer plane 24"L, 2 3/8"W, 6 1/2lbs, 1870-1943. #32 Jointer plane 26"L, 2 5/8"W, 7 5/8lbs, 1870-1934. #33 Jointer plane 28"L, 2 5/8"W, 8 3/8lbs, 1870-1918. #34 Jointer plane 30"L, 2 5/8"W, 8 1/2lbs, 1870-1918. The longest plane Stanley produced. It's not a very common plane, but its appeal was probably limited due to its size for the same reason that one doesn't find 30" long wooden jointers in great numbers. Still, examples in good condition are somewhat scarce, which makes some Stanley collectors foam at the mouth. #35 Smooth plane 9"L, 2"W, 3 1/4lbs, 1870-1942. This smoothing plane, as well as the #36, has a tote. How can this plane, whose length is equal to the #23, have a tote whereas the #23 can't? It's simple - this plane is designed with a step, often called a razee, at its rear. 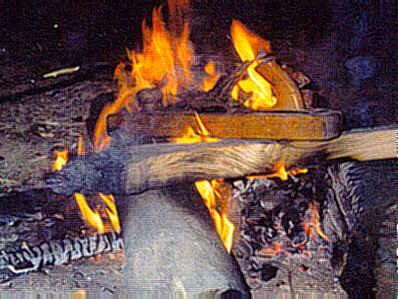 The wood is stepped down, and the cast iron frame is made to follow the step. This design increased the amount of space directly behind and under the cutter, making it possible to equip the plane with a tote. It was a very popular feature, making this transitional smoother one of the most commonly encoutered. Check the cast iron frame, where it steps down for any signs of repairs or cracks. This area is prone to breakage, as is the overhang onto which the tote fastens. #36 Smooth plane 10"L, 2 3/8"W, 4lbs, 1870-1934. This is the same general design as the #35, only it's one inch longer and has a wider iron. Hey, this is like the #4 1/2 Light since it's made of wood. Wonder why they didn't make the #5 1/2 Light? Because they made the #37. The name "Jenny" is unique to this plane. 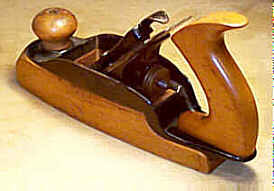 Since this plane is slightly shorter than the metallic jack plane, a parallel naming was taken from the asses (donkies). "Jack" is a commonly used when referring to the male donkey, and "Jenny" is a name sometimes used for the female donkey. The jenny is smaller than the jack, hence the naming of the planes. All of this is really conjecture, but it sure provides some filler for an otherwise bland series of planes. 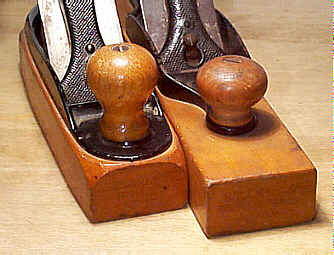 This plane also has the step in the wood, with the cast iron frame following the contour of the wood, though not as pronounced as the #35 and #36. This isn't a very common plane, but Stanley saw fit to offer it for some 50 years.